Small bacteria - Strain MC-1 - can be guided through the bloodstream of a living creature using magnetic fields. Sylvain Martel's team at the École Polytechnique de Montréal thinks that these bacteria can be loaded with drugs or some other payload and then be made to swim to a specific destination in the body. 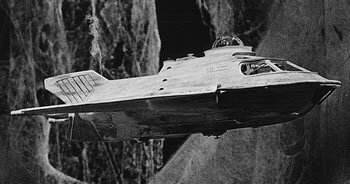 Regular Technovelgy readers should recall experimental work done to try to duplicate the flagellar 'propeller' of bacteria, to create a tiny machine able to move through the bloodstream like the shrink ray-reduced Proteus, the fictional craft from movie Fantastic Voyage. See the work done by Dr. Friend in Australia in Microrobot To Swim Like Bacteria With Flagellar Propeller and the research of Dr. Shoham of Israel in Propulsion System For 'Fantastic Voyage' Robot. "Instead of trying to build a nanomachine it makes more sense to spend effort trying to control what nature provides," says Martel. He and his team are focusing on a bacterium dubbed MC-1 – a microbial speed demon that swims 10 times faster than most species and can travel at top speeds of 200 micrometres per second using its twirling flagella. Apart from speed, the bacterium has another property that makes it a perfect candidate for the role: each cell contains a chain of magnetic nanoparticles, allowing the bacteria to sense and swim along magnetic fields. Although nanorobots may play critical roles for many applications in the human body, such as targeting tumoral lesions for therapeutic purposes, miniaturization of the power source with an effective onboard controllable propulsion and steering system have prevented the implementation of such mobile robots. Here, we show that the flagellated nanomotors combined with the nanometer-sized magnetosomes of a single magnetotactic bacterium can be used as an effective integrated propulsion and steering system for devices, such as nanorobots, designed for targeting locations only accessible through the smallest capillaries in humans while being visible for tracking and monitoring purposes using modern medical imaging modalities such as magnetic resonance imaging. Through directional and magnetic field intensities, the displacement speeds, directions, and behaviors of swarms of these bacterial actuators can be controlled from an external computer. The initial trials were done in rats; the MC-1 bacteria naturally die after about 40 minutes in the blood and are then cleaned up by the immune system.